9/11 School Recovery Program booklet features Feel the Music! | Feel the Music! 9/11 School Recovery Program booklet features Feel the Music! 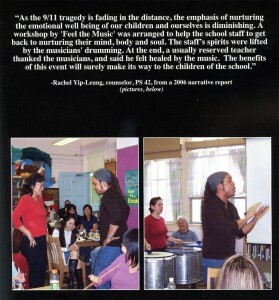 Home9/11 School Recovery Program booklet features Feel the Music! 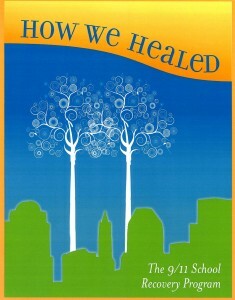 In 2009, the 9/11 School Recovery Program published, “How We Healed”, a review of the many programs and people who came together to assist lower Manhattan schools, students, teachers and social workers after September 11th. Feel the Music! was honored to be able to provide after-school workshops in percussion and songwriting to students in several schools, including PS 42, PS 124 and the Millennium High School. Left: Brazilian percussionist and Feel the Music! teaching artist Dende Macedo at PS 42.The text reads, “As the 9/11 tragedy is fading in the distance, the emphasis of nurturing the emotional wellbeing of our children and ourselves is diminishing. A workshop by “Feel the Music!” was arranged to help the school staff to get back to nurturing their mind, body and soul. The staff’s spirits were lifted by the musicians’ drumming. At the end, a usually reserved teacher thanked the musicians, and said he felt healed by the music. The benefits of this event will surely make its way to the children of the school.” – Rachel Yip-Leung, counselor, PS 42, from a narrative report.